From public sector to private sector, blue chip to SME - more and more organisations are including collaborative workspaces within their work environments. We’ve even started to see sixth forms, colleges and universities following the trend. These forward-thinking organisations recognise that by providing an environment that nurtures their employees’ well-being and happiness, will increase employee engagement, creativity and productivity, which, in turn boosts the company’s bottom line. Technology has advanced at an incredible pace, and it has dramatically changed the way we live. Before we all became so attached to our mobile phones, our social lives were organised well in advance and diary dates were strictly adhered to. Something generations Y and Z will not be able to relate to. These days we can afford to be far more flexible and impromptu. Details of social plans can be left to the last minute, safe in the knowledge that friends will have their mobiles with them. This more flexible attitude has migrated into the workplace. Technology enables us to work from virtually anywhere, so gone are the days of sitting at the same desk all day, with the occasional pre-scheduled foray into a meeting room. Providing people with readily available, communal space for impromptu meetings allows for a level of flexibility that helps to foster creativity and productivity. A communal space also provides individuals with an opportunity to interact with people from other teams and departments that they might not normally encounter. In an age where we are all too eager to send an email rather than pick up the phone, or meet face-to-face, creating an environment that fosters communication and helps to develop healthy working relationships, can only be a positive move. Communal spaces come in all different forms and formats. We’ve met many clients that want to replicate a communal space that they’ve seen working successfully in another organisation. It’s important to remember that what works for one organisation doesn't necessarily work for another. What your company and its employees do, how they like and need to work, and your existing company culture all have to be taken into careful consideration. Of course you also need to consider what space and budget is available. It’s no wonder that so many organisations don’t get it quite right, and find their communal space is underutilised. What could very easily pay for itself in no time, through increased productivity, can quickly turn into a costly overhead. So let’s look in a bit more detail at some of the questions you need to address when considering creating a collaborative workspace. The first question to ask is, what is the purpose of your collaborative workspace? This isn’t necessarily as straightforward as it may seem. Is it simply to provide employees with an alternative space to work, away from their desk? It’s readily acknowledged that sitting behind the same desk from 9 until 5 isn’t healthy or conducive to productivity. Creating an alternative option so that they can benefit from a change of scene is a very viable purpose. Or do you want to provide a space that allows employees to completely switch off from work for a short time – to re-energise and re-focus? Alternatively, yours might be a bustling open plan office, and therefore you’ll benefit from providing an area that offers a bit of quiet and privacy for phone calls and meetings. 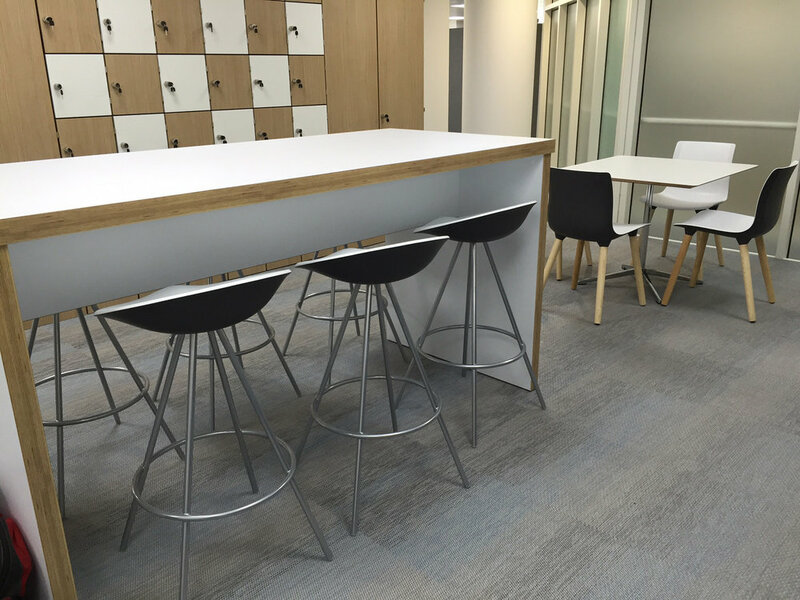 The purpose of your collaborative workspace will be very specific to your organisation. But taking the time to really think about what you want to achieve and what you want to offer, will pay dividends in the long run. Having defined the purpose of the collaborative workspace, you need to make sure it works for individuals across your organisation. If it’s a space where they are going to work individually, do they want to sit, stand, lean or perch? Are they going to be happy at communal benches, or do they need a quiet, comfortable reading corner? The age and demographic of your workforce will have a big influence on the answers to these questions. The good news is, if you have employees across a wide age range, there are lots of solutions to enable you to create a space that caters for everyone. You’ll also need to consider the activities that will take place in the space. If it’s where teams are going to come together to discuss ideas, do they prefer to stand around a white board, or do they need the privacy of a communal pod? Do they require access to refreshments or particular technology or resources? If you’re creating a space for them to switch off from work, then what are you going to offer? A flexible space that can easily be cleared for yoga, or a table that transforms into a pool table? What space and budget have you got? These are of course, two of the biggest questions, but we have left them towards the end, because, irrespective of size of space and budget, there is always a solution. With any new office design or refurbishment, it’s essential that the questions above are thoroughly considered before space and budget are examined. The vast range of office interiors and the flexibility they can provide, means that creating some form of collaborative workspace is a very viable option for most organisations. Our job is to help ensure you maximise your time and investment by ensuring the space is readily adopted and utilised, and you see immediate return on your investment. There are lots of office design, installation and refurbishment projects that we could share with you and here is a selection of recent examples where we completed the design, supply and installation of great looking collaborative workspaces. We thought it would be useful to show you a selection of different collaborative working spaces and furniture options, so you can get an idea of how they might work. Perhaps some of them might be suitable for your office environment? Height adjustable desking is becoming more and more popular. Studies show that a change in posture can help people’s concentration. And let’s face it, we’re all different shapes, sizes and heights, so one size desk isn’t necessarily going to fit all. Why not give your employees an option to adjust their desk height and make sure they’re comfortable at work? Four-person cluster desks are one of the most popular set-ups in open plan offices. Not only do they offer personal space and storage, but the small amount of screening encourages collaboration and interaction. Break out spaces are useful in many scenarios. In busy open plan offices they can provide a quiet corner for individual’s to work and they can also provide an area where teams can get together and collaborate on projects. Why not provide height adjustable workstations in a flexible drop-in or hot-desk area? Users can choose to adjust desk heights according to their preference and nomadic workers can choose to work from a laptop or to connect via a fixed computer terminal. In a busy collaborative workspace, sometimes privacy and quiet is paramount. These small, shielded spaces provide the perfect private working zone for times when individuals need to focus without any distractions. These cellular spaces take matters one step further and provide a private, secluded space where workers can shut themselves away and fully absorb themselves in their work. 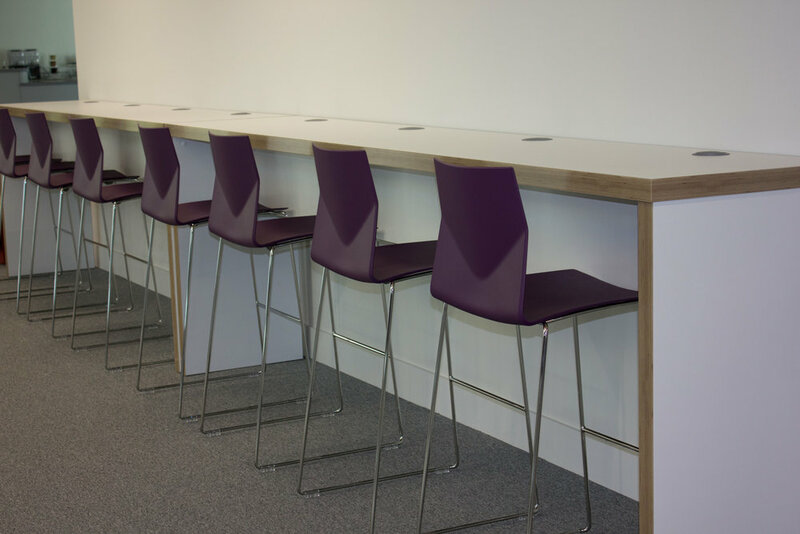 Flexibility in communal working spaces is key to making sure the area is fully utilised. An L-shape seating configuration with additional mobile seating options ensures the space caters for both large and small groups. There are also plenty of acoustic products that can be installed to help ensure noise from larger groups doesn’t disturb the rest of the office. If meeting rooms are like gold dust in your office, then this informal meeting hub provides a perfect space for impromptu small meetings to convene. Not only does it free-up valuable meeting room time, but it encourages collaborative working without colleagues worrying that their conversations will disrupt the rest of the office. This is another informal meeting space. The shield provides privacy, enabling small groups of co-workers to get together and share ideas or carry out quick informal client meetings. The power of the white board can never be underestimated. It’s where ideas are formed and shared, plans are defined and clarity is achieved. Providing the right resources and media in your collaborative spaces will help employees to work together more effectively and productively. If you’ve got a quiet corner of the office that’s rather redundant, or you can rationalise space to create one, then these private meeting pods are extremely useful. Include media connections and places for devices to be plugged in so colleagues can share ideas on a screen. These comfortable, temperature controlled chambers are ideal when privacy is paramount and meeting rooms are hard to come by. Employees no longer have to worry about being overheard or walking the corridors looking for a private space for a confidential discussion. Storage space can be a challenge for hot deskers, so these storage walls provide an ideal temporary place to put personal belongings. 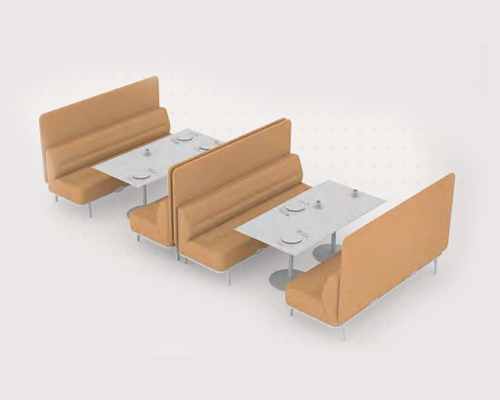 They also function as a partition, dividing up spaces and are particularly popular in receptions and waiting areas. Why not use the storage element to stow away brochures and marketing collateral that needs to be easily accessed? Every surface has a potential use and the back of a storage unit is the perfect example. Add fabric and use it in meetings to pin up visuals or attach a white board to the surface and give people somewhere where they can convene to brainstorm ideas. With so many people working remotely and visiting the office sporadically, shared desk spaces are becoming increasingly common. If you operate a clear desk policy, then lockers are an ideal solution for keeping working areas clean and clutter free. Similarly, pull-out storage provides space for personal items to be carefully stowed away. Every office interior needs an occasional break and the benefits of stepping away from the desk and the screen are well documented. Why not provide a communal, relaxed dining space where employees can enjoy their lunch or a coffee whilst catching up with colleagues? Happy workforces are proven to be more productive and what makes people more happy than social interaction, combined with food and drink? Encourage workers to join colleagues for a quick catch-up and a cuppa with an informal, contemporary dining space, such as this bench and stool set-up, or alternatively a café setting that invites people to pull up a chair. 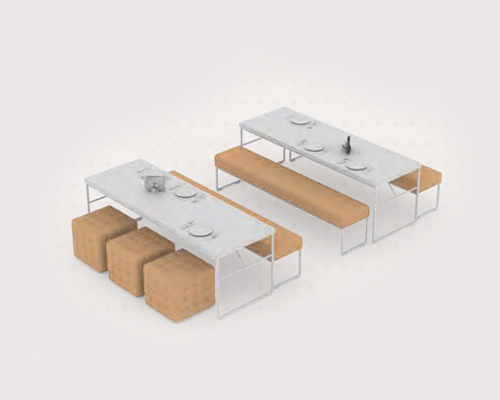 When space and capacity is an issue, then bench style dining is a solution. Large tables and bench style seating encourages communal dining and interaction whilst providing maximum capacity when space is at a premium. We hope that some of these collaborative workspace ideas have given you food for thought but as we mentioned earlier, there are lots of potential solutions to consider and we would be happy to offer advice and help guide you.